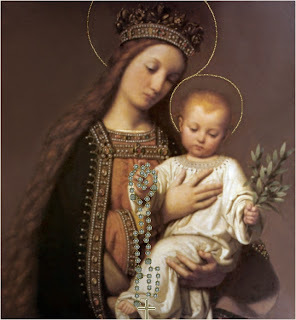 The Child Jesus spoke these words: "Have pity on the heart of your Most Holy Mother. It is covered with thorns, with which ungrateful men pierce it at every moment, and there is no one to remove them with an act of reparation." Now I know where Joey got the phrase! 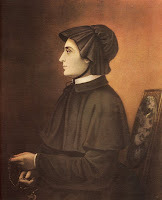 Picture has been changed because an observant reader questioned whether the previous picture was indeed Mother Seton or Mother Cabrini. After closely looking at it, I think she was right...it was Mother Cabrini. Mahalo Patm! Fr. Paul gave a wonderful little homily on Mother Seton today at Mass. He talked about how she was an Episcopalian who converted to Catholicism mostly due to the good influence of her Italian friends in Italy...her love of the Eucharist...that she was a wife...mother of 5 children...then widow....how she started an order, the Sisters of Charity...and how she is also known as an educator because she started the parochial Catholic school system in the United States, and how she is the first American born saint. But what captured my attention most of all is when he told us that she was at George Washington's Inauguration and how she even danced with President Washington at the Inaugural ball! Fr. Paul is also from New Jersey which explains his admiration for this particular saint, who is very big on the East Coast... She hails from New York after all. He mentioned that Seton Hall University in South Orange is named for her. He also mentioned that the Sisters of Charity are still in New Jersey. In fact, the mother house is in Convent Station. A very beautiful place to visit if you have a chance. Our dear friend and my sisters' 6th grade teacher Sr. Lucy Mary Sullivan resides there. And to all you families with children in parochial schools or who use the Seton Home Study Curriculum for homeschooling...HAPPY FEAST DAY! The Feast of the Most Holy Name of Jesus is associated with the Feast of the Circumcision. In accordance with Jewish culture of the days when Jesus dwelled on earth, a child became a full member of his family when he was circumcised, at which time He received His name. The Feast of the Holy Name of Jesus was officially granted to the Franciscans on February 25, 1530. From there, it spread over a great part of the Church. The Franciscans, the Carmelites, and the Augustinians kept this Feast on January 14th. the Dominicans on January 15. Around 1643, the Carthusians obtained permission to celebrate this Feast on the second Sunday after Epiphany. Before long, this date was extended to Spain. About eighty years later, on December 20, 1721, the celebration of the Feast on the second Sunday after Epiphany was extended to the Universal Church. "The sweet Name of Jesus produces in us holy thoughts, fills the soul with noble sentiments, strengthens virtue, begets good works, and nourishes pure affections. All spiritual food leaves the soul dry, if it contain not that penetrating oil, the Name Jesus. When you take your pen, write the Name Jesus: if you write books, let the Name of Jesus be contained in them, else they will possess no charm or attraction for me; you may speak, or you may reply, but if the Name of Jesus sounds not from your lips, you are without unction and without charm. Jesus is honey in our mouth, light in our eyes, a flame in our heart. This name is the cure for all diseases of the soul. Are you troubled? think but of Jesus, speak but the Name of Jesus, the clouds disperse, and peace descends anew from heaven. Have you fallen into sin? so that you fear death? invoke the Name of Jesus, and you will soon feel life returning. No obduracy of the soul, no weakness, no coldness of heart can resist this holy Name; there is no heart which will not soften and open in tears at this holy name. Are you surrounded by sorrow and danger? invoke the Name of Jesus, and your fears will vanish." "Never yet was human being in urgent need, and on the point of perishing, who invoked this help-giving Name, and was not powerfully sustained. It was given us for the cure of all our ills; to soften the impetuosity of anger, to quench the fire of concupiscence, to conquer pride, to mitigate the pain of our wounds, to overcome the thirst of avarice, to quiet sensual passions, and the desires of low pleasures. If we call to our minds the Name of Jesus, it brings before us His most meek and humble heart, and gives us a new knowledge of His most loving and tender compassion. The Name of Jesus is the purest, and holiest, the noblest and most indulgent of names, the Name of all blessings and of all virtues; it is the Name of the God-Man, of sanctity itself. To think of Jesus is to think of the great, infinite God Who, having given us His life as an example, has also bestowed the necessary understanding, energy and assistance to enable us to follow and imitate Him, in our thoughts, inclinations, words and actions. If the Name of Jesus reaches the depths of our heart, it leaves heavenly virtue there. We say, therefore, with our great master, St. Paul the Apostle, 'If any man love not our Lord Jesus Christ, let him be anathema.'" The Name of JESUS is the shortest,the easiest, and the most powerful of prayers. Everyone can say it, even in the midst of daily work. (provided, of course, that it be for His glory and the good of our soul). we give great glory to God and obtain for ourselves priceless graces. 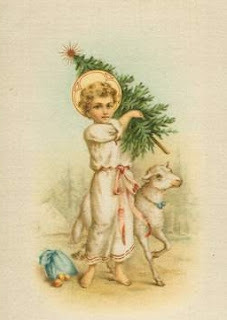 Make an act of perfect love, offering to God all the infinite love of His Divine Son as if it were our own. Offer the Passion and Death of Our Lord to the Eternal Father for His greater glory and our own intentions. Offer to God all the infinite merits and perfections of Jesus. Offer all the Holy Masses said each day throughout the world, for the glory of God and the good of our own and others' souls. we increase in our souls the virtues of faith, hope, and charity. and our love more intense. helps us to overcome temptations, and delivers us from the power of the devil, who is constantly seeking to do us harm. we can gain an indulgence of 300 days, which we may apply to the souls in purgatory, thus relieving and liberating many of them from their awful pains, and gaining for ourselves friends who will pray for us with incredible fervor. when walking, riding, or waiting. We can say it countless times every day, and thus gain untold graces and blessings for ourselves and for the whole world. Nothing is easier, if only we do it with all our heart. The frequent repetition of the Name of Jesus far from tiring. It gives us joy, a peace, a happiness we never had before. When working-no matter what we may be doing- we can go on saying Jesus at home, in the streets, walking or driving in cars. in trains, everywhere. When ladies go shopping. when men go and return from their work, when workers are toiling all the day long, they can easily get into the habit of repeating Jesus. No effort is required, all we have to do is to let this blessed Name flow from our hearts and lips. The one thing that we have to do is to form the habit of constantly saying Jesus. In the beginning we must give It care and attention in order to acquire the custom of saying it. Then we shall have an immense treasure in our hands for the rest of our lives. The January and February Issue of The Friends of the Holy Souls Newsletter has been posted. Mary Ann shares intriguing stories by a friend "John" regarding visits from Souls in Purgatory. Also remember that the best thing you can do for your family members who have died, is to pray for the repose of their souls and to have Masses said often for this intention. If they are already in Heaven, then I believe that the Masses will be applied to the souls in purgatory that are in need of them. The Masses and prayers will not go to waste. I've mentioned this before but I can't stress it enough...it is better to have Masses said for us now than after we are dead. Why not consider offering Masses for your loved ones, friends, and/or yourself as a gift for birthdays, anniversaries, etc. If you need help with the Masses, you can check out Mary Ann's blog as she has priests who offer Masses for people. Father Stephanos has posted a Liturgical Biography of Jesus which is a good resource and reference to have. Mahalo Father! 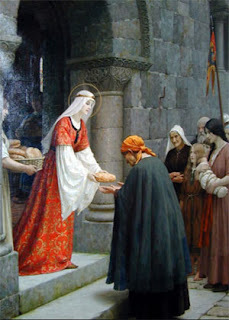 Today St. Elizabeth of Hungary officially takes over as my patron saint. So long for now St. Michael the Archangel. You have been a good patron saint for the year and I will miss you. I am a little familiar with this saint because she was the patroness of my sister's old convent, The Franciscan Sisters of St. Elizabeth. But I want to learn more so it is my goal to read more about her and I will share it here. The following is from The Book of Saints: A Dictionary of Persons Canonized or Beatified by the Catholic Church, complied by the Benedictine Monks of St. Augsutine's Abbey, Ramsgate, 1966, Nihil Obstat Francisuc M. Mildner, O.S.M. and Imprimatur Patritius Casey. Born at Presburg, the daughter of King Andrew II of Hungary and a niece of St. Hedwig. At the age of fourteen she was married to Louis IV, landgrave of Thuringia, and bore him three children. Hers was a very happy married life until 1227 when her husband went to the crusade and died at Otranto. She now became a Franciscan tertiary and devoted herself to the relief of the destitute, living a life of voluntary poverty until death at twenty-four. She was canonized three years later (1235). I am glad she is a Franciscan. I have a deep love for St. Francis and the Capuchins. Even though it is not a Holy Obligation in Hawaii, I know there will be many people at all our Masses to tomorrow in honor of our Blessed Mother. Only a few hours more, and this year too will come to an end and pass into history. I too finish the year and await the new dawn of joy. I go down on my knees before my God and, recalling His kindnesses to me this year, I humble myself in the dust and thank Him with all my heart. Thank you Sue for sharing it. May we always profit from the prayers of the Virgin Mother Mary. 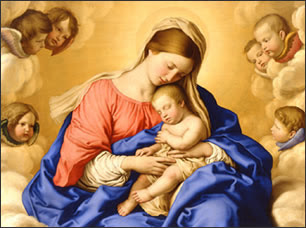 May her prayer, the gift of a mother's love, be our joy throughout this new year. 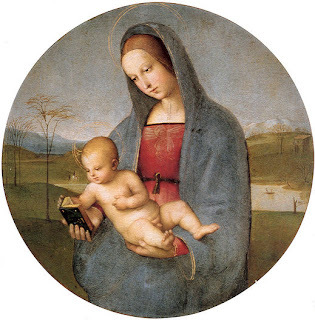 We proclaim the Virgin Mary to be the Mother of Christ and the Mother of the Church. The birth of Christ is the source of life for the Christian people, and the birthday of the head is the birthday of the body. That's the Way to Honor Our Lady on Her Solemnity! ..and the entire Holy Family... I would post it here but it looks so much more dramatic over at Fr. Daren's Mahalo Father! I've been thinking a lot about my New Year's resolutions. Mostly, they involve spiritual improvements. It really helps when you examine your conscience nightly to see the areas where improvements can be made. I was tempted to ask my family members and very close friends to let me know what about me bothers or irritates them so I can improve that way. But I think I would only be looking for trouble if I did that. The best thing I can do is to practice dying to self, and with that hopefully will come humility. I hope that I will not impose my will on others but do God's Will instead, in everything. The other day for example many little things occurred, one after another, where I was either humiliated, or wrongly judged. Usually, this would bother me beyond belief but by the grace of God, this time I remembered to offer it up and unite it with Jesus' sufferings. What a difference that made! With this new year, I hope to be able to practice more and more humility. 1. To be more patient. To look at the crucifix and focus on Jesus' patience when I am about to lose my patience. This was the advice of two good priests in Hawaii. 2. To not take things others may say or do, personally or jump to conclusions. In order to not do that, I have to learn not to judge anyone because I do not know what's in their heart. This is advice from another good priest in Hawaii. 3. I will live for the day as if it were my last day on earth. By doing so I will try to avoid offending God by sinning in even the slightest way. 4. To be silent more often like our Blessed Mother and St. Joseph. To not engage in frivolous conversations or God forbid, gossip. Reading the Imitation of Christ helped me with numbers 3 and 4. 5. To follow the example of our Blessed Mother and St. Joseph in their parenting ways...loving their child with a quiet and dignified manner. 8. To be patient and kind to the members of my family as I am with those outside my family. 9. To read more books that will help me grow spiritually. The following is from A Catholic Life. So nice to have Seminarian Matthew posting again. our household, and all that belongs to us. 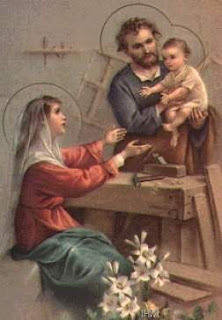 and the example of your holy guardian, St. Joseph. from all evils and misfortunes. which you allow to come to us. Finally, give all of us the grace to live in harmony and love toward our neighbor. the comfort of your Sacraments at the hour of death. and God the Holy Spirit, who sanctified us at Baptism..
and bring us all to everlasting life.